Cha-Cha-Cha, Mambo, West Coast Swing, Rumba, Merengue, Salsa, Foxtrot, Tango and Waltz. Learn to dance 9 dances with our easy to learn techniques perfected by our highly recognized team of instructors. Taking private classes/lessons for either your wedding or social dancing is the fastest way to learn with confidence and ease. 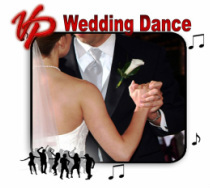 Make your first dance as husband and wife as special as everything else on your wedding day!